Roasted Coconut paste will give a distinct taste to Fish curry. 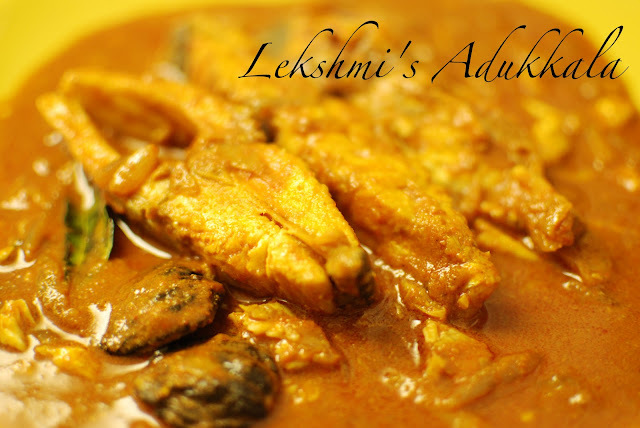 We have used Pomfret (Aavoli) to prepare this fish curry. Heat 1 tsp of oil in a pan, add grated coconut and saute till golden brown. Add chilly powder and corriander powder and stir for a few minutes. Add shallots/ onions, chilly, chopped ginger- garlic and saute until the onion turns transparent. Add coconut paste, water, salt, kudam puli and turmeric powder and allow to boil. When the gravy gets thick, add the fish . Cover the pan with a lid and allow to cook for 10 minutes. When the fish is cooked, remove from fire. Add fenugreek powder , curry leaves and remaining Coconut Oil. Sounds absolutely delicious. Always looking for new warming recipes this time of the year and South Indian flavours are always a favourite in my family!